The fastest ever year of the IMSA WeatherTech Sports Car Championship’s fastest Prototype class continues, this time, with a new Prototype class lap record at the 12 Hours of Sebring. Tristan Vautier will start Sebring out in front after claiming pole position with a 1:47.432 lap time in the No. 90 Spirit of Daytona Cadillac DPi-V.R. The fastest lap of Sebring still belongs to the LMP1-class Peugeot 908 HDI FAP, which set a 1:44.27, according to FastestLaps. But to see these roughly LMP2-equivalent cars inching up closer and closer to those old LMP1s is kind of fun, not going to lie. However, it wasn’t a great session for Mazda Team Joest, whose qualifying laps were only good for seventh and ninth in the results, and on top of that. To add insult to injury, both Mazdas will start from the back of the grid tomorrow. They had too much tape over their bodywork seams, per racing journo Marshall Pruett. Either way, it’s a truly bizarre post-qualifying technical violation to get slapped with. What happened to the Team Joest who knew not to get busted over that sort of small stuff? 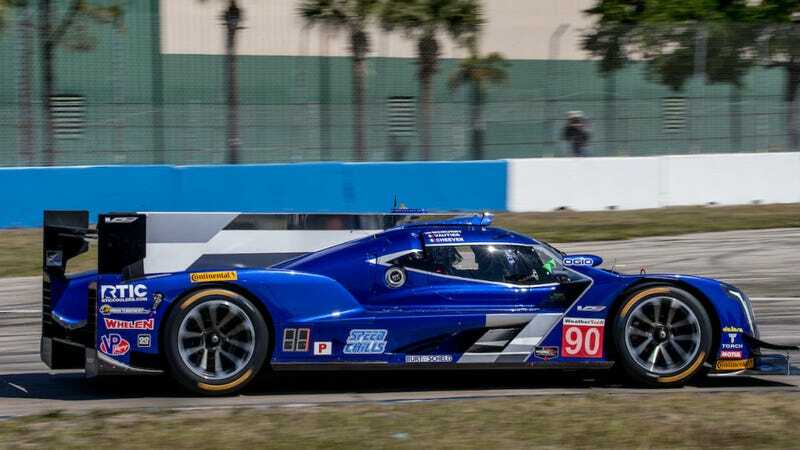 Last year’s winners and reigning Prototype class champions Wayne Taylor Racing somehow qualified tenth after struggling to adjust the car to their liking and find speed, but luckily, they’ve got twelve hours to make up for it tomorrow. United Autosports’ No. 32 Ligier LMP2 qualified last in the Prototype class, so they’re opting to swap their engine overnight for a fresh one, reports Racer. The No. 32 was a full two seconds off the pace of the pole-winning lap. In the GTLM classes, the BMW M8 GTE is no longer off the pace at all. The No. 25 BMW will start from pole position, followed by the No. 62 Risi Competizione Ferrari 488 GTE and then the other No. 24 BMW M8 GTE in third. The No. 51 Spirit of Race Ferrari 488 GTE will start from pole in the GTD class. Jalopnik Bump-wearers HART will start eighth in the class with their Acura NSX GT3. Another NSX GT3, the No. 93 of Michael Shank Racing, was still rebuilding their car after a hard practice crash and did not make it out to qualify. You can view the full results here, as I start to wonder whether they’ll beat the overall distance record for the 12 Hours of Sebring this year, too. They set a new distance record at Daytona in January, so it’s definitely possible.